I had a weekend of near misses in Palm Springs. Nearly missed the podium at the American Open, with a fourth place finish. Nearly missed the podium at the Outlaw Open with a second place finish after having the lead going into the final. I would be lying if I didn’t admit I have a terrible taste in my mouth about those finishes, but also mixed feelings. Part of me is actually ok with how things went. Both competitions provided me an opportunity to hone my craft, to test myself under pressure, expose weaknesses, check my progress, practice some of the skills that will help me going forward, and grow as an athlete. I got to workout with an amazing field of women. The other part of me feels obligated to beat myself up as atonement for “failing”. Sigh. I’m not going to let the latter part win because it’s a waste of time. There were so many positive things for me this weekend it would be a shame to reduce success or failure to simply where my name fell on the final results sheet. 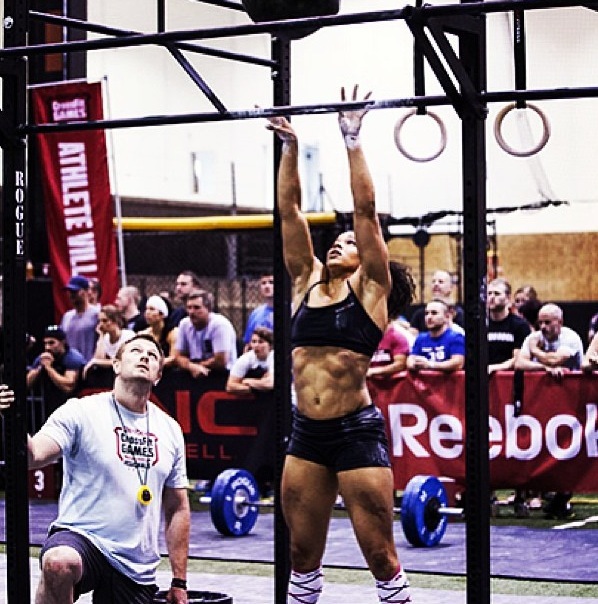 I realized at the 2012 CrossFit Games I didn’t enjoy myself at all, I didn’t open my eyes and experience what was happening, I didn’t even focus on the things that would’ve been helpful to my performance because I was too worried about what was on the leaderboard. I perform much better when I focus on what I need to do technically in each moment, use positive self-talk, or repeat an affirming mantra to myself while I work out. Based on my experience at the Games this past year I developed a list of things, mental game things, which I wanted to improve on. I haven’t participated in other high level competitions outside of the formal CrossFit season, and I’ve haven’t gone into a lifting meet on a national podium without specifically training for it. As a result, I felt a sense of discomfort going into these competitions knowing that I’m not in peak condition, lifts aren’t really where I’d want them and such. Treating this weekend as a special training opportunity (albeit one with a $10,000 winner take all prize purse) finally helped me get excited for it after having some initial ambivalence about competing. With the exception of the final workout of the Outlaw Open I felt I did a really good job of executing my plan and practicing the things I set out to put into action. The final workout was a tough, nasty chipper and I’ve been feeling bad about my performance on the event. Though when I reflect back on it I didn’t perform that poorly. I took fourth on the workout. A twenty minute piece, not my favorite length of workout. I took fourth to approximately 11 years worth of Games athlete in Becca Voigt, Kris Clever and Lindsey Valenzuela. Being beaten by those girls doesn’t exactly mean you’re chopped liver, if you know what I mean. Lindsey Valenzuela was crowned the victor this weekend, and I think she would agree it was a great battle throughout the competition. Taking second to Lindsey makes the pill of losing a little bit easier to swallow because she’s such a great all around athlete, a gracious competitor, and on top of that her 92 year old grandfather was at the event to watch her CrossFit for the first time. Kinda awesome. It made me think of my own grandfather who has passed, but was always a huge supporter of my athletic endeavors. There were some physical accomplishments that were really exciting to me. One of the scoring points for the weekend was an agility test. The event was set up with a series of five 20-inch plyo boxes in a row with lateral hurdles on alternate sides. You had to jump over each box, then back and forth laterally over each hurdle. This was immediately followed by a shuttle run and back over the box/hurdle course. Honest to goodness, prior to CrossFit I spent many years avoiding jumping and movements such as the lateral stop on a shuttle run like the plague (that shuttle run at the Games with the cleats on felt like a horrible idea). I have no ACL in my left knee and I’ve had problems with it feeling unstable in the past. When I started CrossFit and was presented with doing box jumps or even jumping rope I was really concerned and had no idea if I could do it. Seeing an event like this agility test was actually a worst -case scenario for me. The last thing I want to do is bounce around like Tigger. However, after putting some work in I was able to perform it relatively smoothly and with confidence, managing to come in second on the event. I’ve found that my leg with the knee issues has gotten stronger through CrossFit, weightlifting, learning to squat properly, doing GHD raises, etc. Just as important if not more so, CrossFit has forced me to challenge the assumptions I’ve made about what my body can do and it’s given me the incentive to knock down self-imposed limitations. It’s amazing how empowering it is every time you accomplish something you weren’t sure you could. That never gets old, and I think reinforces your ability to move forward on faith knowing that you will find a way, adapt, learn, grow and rise to the occasion one way or another. Every experience of overcoming makes it that much easier to believe in yourself the next time around.